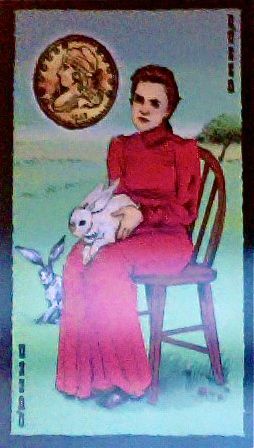 Weekend Reading: Queen of Pentacles from the Prairie Tarot. Be gentle with yourself and others this weekend. Let your nurturing side come out. The Queen of Pentacles is a doting, motherly woman. Her rabbits feel safe and secure with her. In turn, their love and gentleness fuel her. Any energy she spends on them is returned by them. That's part of being gentle with yourself...nurturing situations that nurture you back. So consider that this weekend. Let go of what drains you. And embrace what fuels you.